I'm always so sad when I see a moving sale and know that the home has been foreclosed. So much of that happening today and such heartbreak for so many families. There was such a sale a couple of weeks ago a few miles from my house, and of course I stopped to see if I could buy anything to help this family out. They had everything in their house for sale. I almost cried. One thing that I did find was this Antique Regulator Clock. It fits in well with the other clocks I have. She had all of her prices so low that I told her to raise them, she didn't need to give everything away. 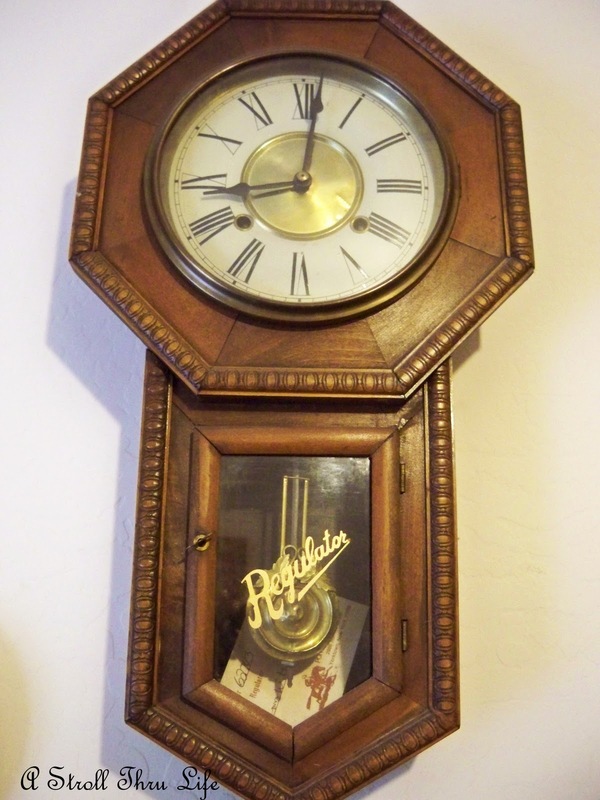 She had this clock which was made sometime around 1900 to 1910 priced at $25. It is worth around $100 since it was not a very expensive one to begin with. I gave her $50 for it. I think it will be perfect in my collection. It works perfectly and has the key to wind it. At a seperate sale down the street, I found a few cute things too. 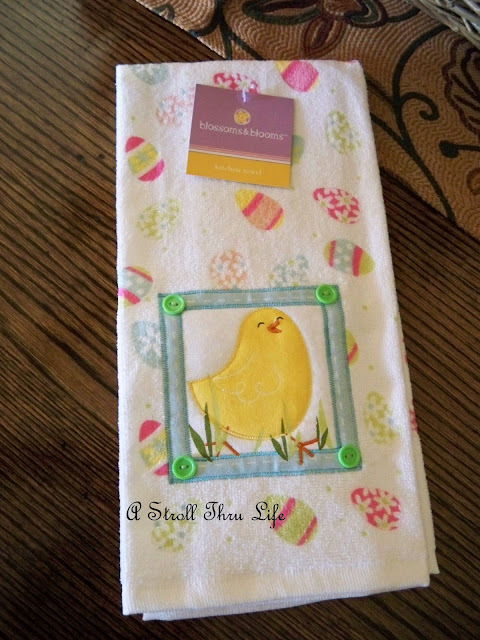 Brand new fun tea towel for Easter for 50c. 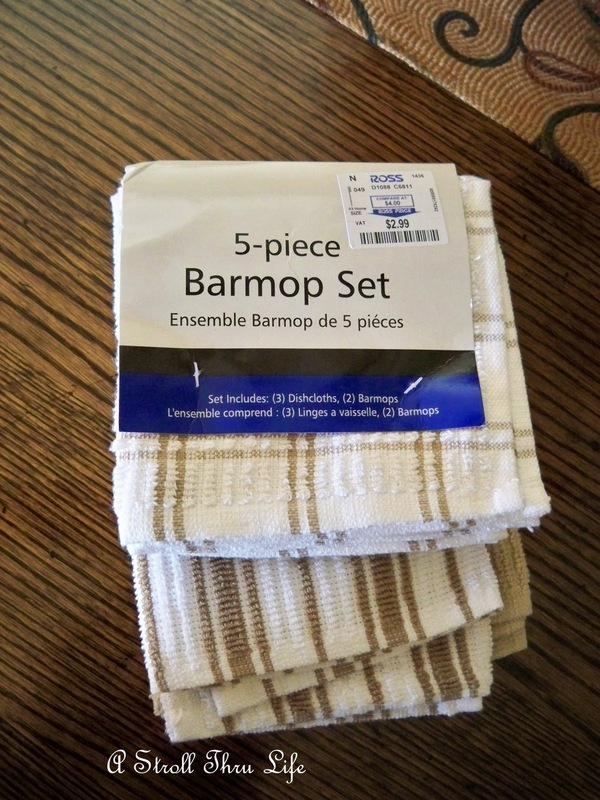 Also this basic set for the kitchen for $1. A tusk handle magnifying glass. The tusk is resin, but the shape was fun. For $2 I had to have it. Thanks so much for stopping by. I always look forward to your visits. I can't wait to see what all you found this week. You were nice to give the lady more than she asked for the clock. I'm sure it made her happy to see it go to a person who will treasure it. Great finds Marty! I scour Craigslist often and know that many people are selling all of their stuff because they are being foreclosed on and are moving soon. Very sad. Marty I love the boots! Great finds, Marty. How kind you were to pay more for the clock than asked--what a blessing to those folks. ps my new blog is up and running! Nifty finds Marty. Love that clock! Marty, How sweet of you to pay more than the asking price for the clock. I am sure she appreciated it. The clock is wonderful and you still got a great deal. Love all your finds and I so appreciate you sharing this at my new party. Thank You! Bring those sweet rain boots up here, we have pleanty of sloppy rainy weather! Your post touched me so that I had to comment today. I agree with the other commenter that your offer over and above her asking price shows so much about your character. God Bless you Marty. Oh Marty, how sweet of you to pay more for that clock. It breaks my heart too to see this happening. I love your boots! What a fun find. Hi Marty! How kind of you to give the lady more for the clock and it's a beauty! The foreclosures are so sad and to sell all of your things! Just breaks my heart! You did fine some pretty things! Still thinking of your grandson and hope he is continuing to improve! Marty, the clock is beautiful! How sad to see people lose their homes. Things seem to be getting worse. Love all your finds, that horn is unique! You are such a sweet, sweet spirit! Helping those people out with their Garage Sale, I was blessed at your story about the clock. Now those boots are definitely for gardening, but wouldn't red geraniums look lovely placed down inside? That's my "city girl" story. .. and I'm sticking to it! HA! That was so sweet of you Marty to give her extra. I would have done the same thing and yes it is so sad to see that happening. I love your finds! Those boots are adorable! Great finds Marty. You seem like a very caring lady. Marty I love your finds!! It was generous of you to help that family out! I'm not surprised by your kindness and generosity. You have a big heart. I feel bad for people who are going through this hardship. Right now, I have a dear friend who is struggling financially. It's very stressful. I love the clock and it will be perfect in your home. Love your find, it is beautiful! How kind of you to give the lady $50 for her clock...but I'm not surprised! Times are hard for so many right now. Love your other goodies too! You always find the neatest things. Isn't it sad what our country is coming to,people working so hard and ending up with nothing. Thand goodness there are still good people with hearts like yours. I am noticing there are fewer just garage sales though, I think people are holding on to their stuff and wearing it out. That is so sad about the family. But very sweet of you to help them out...and give them double what they were asking!! Good for you. That's an impressive clock you got! It looks immaculate! I would have done the same thing, it's worth far more than they asked and your generous spirit will be rewarded! Very sweet of you to give her more than she had asked for the clock. She will remember you! You found some great deals! Especially those adorable rainboots! I have a clock that was given as a wedding present 35 years ago that is very similar to that one, I think it is so special that I will never be able to part with it. That type of situation just breaks my heart. I couldn't imagine. You were sweet to tell her what you did. I love those boots. So cute. I could use a magnifying glass around here! Such beautiful things Marty. It was wonderful of you to treat your neighbor for her clock. I know she was thrilled to have you take it home. You are always So Sweet. I LOVE the boots. I have a similar pair with a fall leaves print on them...I LOVE Yours. 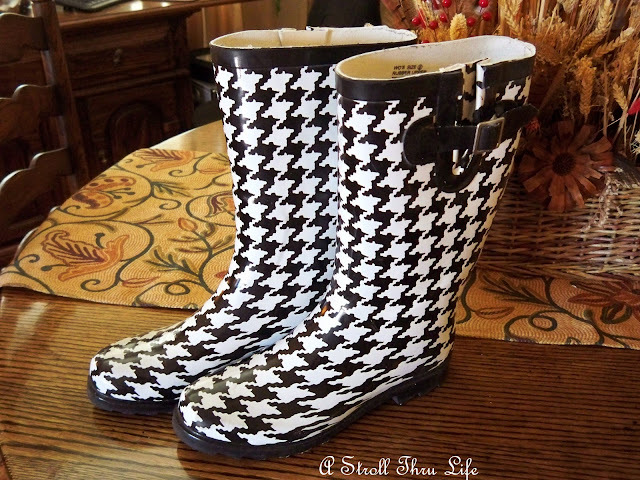 I call them my Muck Boots for muddy gardening! I'm LOVED the picture you posted of your Grandson with his guitar. He's young and will be making the best of his time TILL he's Back GOOD AS NEW again! Hi Miss Marty! It appears that you are back in AZ. I hope your grandson is doing well. I am contacting everyone as a reminder and an inquiry to see if they're attending the AZ blogger's luncheon on March 26th as I have to call the tea room on in the next few days with a head count. Details are on the Monday (3-14) post of my blog. If you are attending please leave a comment on that post. How sweet of you! I love those rainboots. And the clock is very pretty. I cannot wait for the garage sales to start here. Should be any week now! Marty, it is sad to see people forced out of their homes. Great finds. Love those boots! Marty, you are so sweet and considerate to help out that family! And everything you found is just wonderful. Those boots are darling! It's heartbreaking to hear about someone losing their home. How kind of you to help her out and encourage her not to give her precious belongings away. Great finds, Marty. I can't image the trauma of having to give up one's home. You are a kind and generous person. Fun finds Marty! I just saw those rainboots at a local retail store for $26.95! i love everything that you showed us today!! What great finds!! What a kind heart you have. I do think you are the Queen of Bargains! You always find the greatest stuff! Marty, YOU are a GOOD woman.. I am glad you got the clock and so sorry for those folks leaving their home. That is a beautiful clock. The fact that you paid the lady more money than she was asking is, well, so typical of the sweet, kind-hearted person you are. Thanks for being that person, Marty. What a good soul you are to have paid more for the clock than she was asking -- yard sale gals are the salt of the earth! We haven't had any foreclosure yard sales in our area -- that I know of! -- but I know that your area was particularly hard hit by the housing slump. Our house is worth less than when we bought it, but everyone's is, it seems! My dad's beach house is WAY down in value -- who's buying great big vacation homes in this economy? Love your finds -- and I'm glad the tusk is resin! I'm not sure if anyone else mentioned this -- but the link you have for A la Carte blog goes to another blog entirely --- one with some rather interesting content. Definitely NOT a decorating blog! Marty! you have such a wonderful heart - I bet you could have taken her sale and create a terrific success for her. I appreciate how you feel - it is hard to see folks going through so much, and so many of them today it is not their doing. But, when we go through tough times and lean and trust on God - we come out all the better to be able to help others go through the same - I think you hit her sale for a deeper purpose - to encourage her! 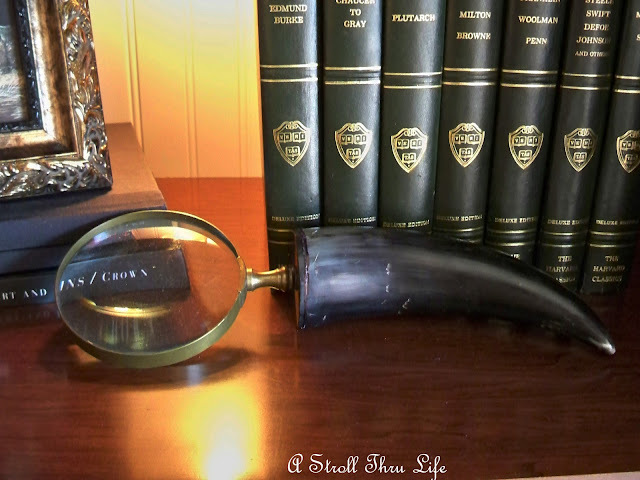 Love your finds - especially the magnifying glass! We haven't had any forclosure sales around here that I know of. It would be sad. You got a great buy with the clock. Marty, I have a clock almost identical to that one! My brother-in-law purchased it in Thailand as our wedding gift 40 years ago! Still works like a charm! Marty, what a haul!!!! Loving everything, but those galoshes, well they are divine!!! Hugs and Happy Spring! Oh Marly dear, how sad it is how so many families in my dear country are going through such hardship with forclosures on their homes and you were so generous to double the price of such nice clock...we inherited my FIL's clock that was bought in the 40's sometime in NYC where it was made by: ANSONIA CLOCK CO.- New York, USA... and we have to wind it too with a key, I love it cause the sound reminds me of their home. That was so kind of you! It is so hard right now to see people loosing their homes. Atleast we aren't loosing them to catastrophic events though.... I guess that is something. You did get some wonderful bargains though. Looks like we all need those boots Marty! Times are hard worldwide, and your sort of generosity is what we all need to show more of for us all to get along together. Marty, I'm sure you were a blessing for that lady having the sale. You found a great clock and she got more than she asked. A "win-win" in my book. Great finds at the other sales..love the boots. Have a great Sunday. Hugs. Those boots are made for walking Marty...love em. Very kind of you to offer more on the clock...it sure is pretty. What a wonderful day of tag saleing. You did so well! It would be grea to have you come bring your treasures and be a part of Seasonal Sundays. Wonderful finds! I collect clocks- so I think you really lucked out with that.Thank you for visiting me at Brambly, I was so glad to see you had. I really appreciate your "Table Top Tuesday" and admire your blog. Have a wonderful weekend!